February is National Children’s Dental Health Month. If you have a baby or toddler, you may have questions about thumb sucking, your child’s first dental visit or how and when to clean your child’s teeth. 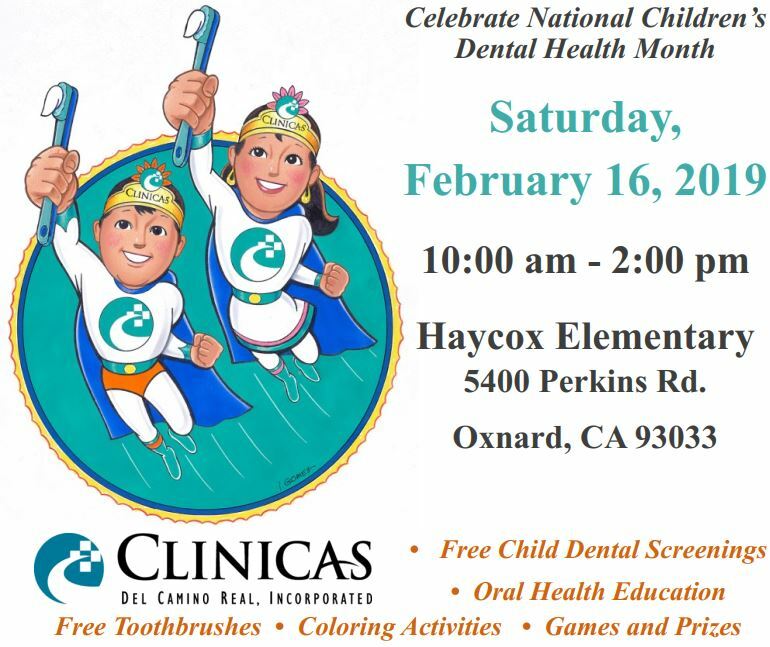 If so, on Saturday, February 16th from 10am-2pm, Clinicas invites the Ventura County Community to join them for a dental health fair taking place at Haycox Elementary, 5400 Perkins Rd, in the city of Oxnard. Clinicas will offer free dental health screenings, oral health information and free tooth brushes. There will also be coloring activities, games, entertainment, prizes and raffles. Parents will also learn about the importance of regular dental examinations and preventative dental services. Clinicas can make a difference in the lives of children by educating parents about the importance of oral health. “Early Childhood Caries (cavities) is the number 1 chronic disease affecting young children” (American Academy of Pediatrics). The American Academy of Pediatric Dentistry recommends an oral health risk assessment exam by age one. According to the US Department of Health and Human Services, 27% of children in Ventura County did not see a dentist in the last year. Throughout the County, adults and children alike are visiting emergency rooms for dental issues that likely could have been avoided with regular dental check-ups. Last year we were able to establish dental homes for thousands of children in the County. Unfortunately, there are still many children who do not have a dental home and have to miss school because of tooth pain. “A healthy smile is important to a child’s self-esteem and with proper care, a balanced diet and regular dental visits, their teeth can remain healthy and strong. Our aim is to establish a dental home for all the children in the county by the age one and diminish the burden of Early Childhood Caries” said Dr. Jaspreet Bal, Dental Director at Clinicas. For more information on the Dental Health Fair at Clinicas, call (805) 647-6353 or visit their website at www.clinicas.org.